Cute baby Hazel dreams to become one of the world's most famous... pastry chefs when she grows up, you know. It's not just the finger-licking good pastry goodies that she'll learn to bake that she's exited about, but also about the cute chic chef outfits and accessories that she'll get to wear. Since she's getting ready for attending her fun baking class for kids in just a few minutes, what would you say about helping her be not just the most talented, but the chicest little chef in her class, too? Help her try on several of her lovely chic white, button-up coats, some of her girly pleated skirts and cute colorful pants, too, then seize the chance of dressing up tiny chef Hazel in some of her lovely chic, babdydoll-like chef dresses, too! 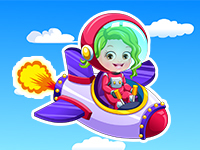 If you play baby Hazel games as often as you get the chance, you'll love turning your cute little friend into a sweet and so very chic little chef! Do you love the pretty purple one with a cute heart-print apron or the black-and-white, striped one more instead? Last but surly not least, remember to finish off each one of her adorable pastry chef fashion looks with sweet chef hats, too!